During the years when Karl G. Maeser was principal (1876 to 1892), Brigham Young Academy students were placed into graded departments according to their level of learning. From the beginning, Principal Maeser had aspired to build an advanced high school, but he did not find a sufficient number of students who were ready for the upper divisions. Primary students were accepted in order to meet operating costs and to satisfy the educational demands of Provo residents. The Lower Division encompassed the Primary Department, the Preparatory Department, the Intermediate Department. Later a Kindergarten Department was added. The Primary Department was created for students from six to eight years old, and for students who had never before attended school. Most primary students were from Provo. Between 1876 and 1892, the Primary and Preparatory departments made up almost twenty percent of the Academy's enrollment. The Upper Division included the Academic and the Normal (teacher preparation) departments, both at the high school level. In 1882, school officials felt that they should eliminate the primary grades, hoping that a growing number of advanced students would offset the loss of enrollment and income. 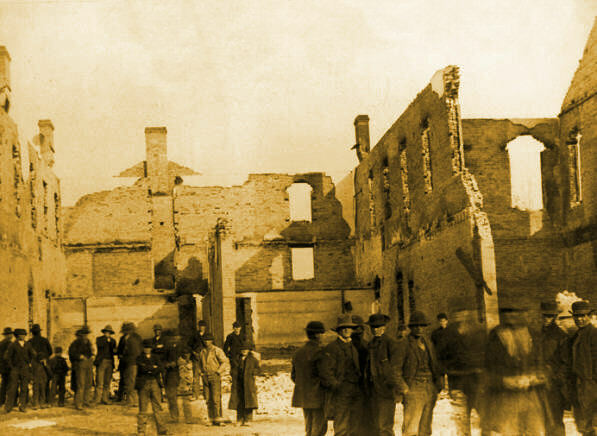 But in 1884 the Academy's main facility, the Lewis Building, burned to the ground. Overall attendance at the school decreased after the fire, reaching critical stages during a depression that came in 1886-1888. Fire guts Lewis Building in 1884. By 1886, it became necessary to renew the Primary Department. The Academy once again advertised for primary students in order to increase tuition income and to fill up the half-empty halls of the ZCMI warehouse. The department's popularity among local citizens brought immediate support. The school's education program discovered additional advantages in maintaining a healthy Primary Department. Second-year (senior) normal students were required to have practical classroom experience. Everyone involved found it was more convenient to "student teach" youngsters who were attending the Academy rather than to go outside to other schools. Employing "normals" to teach also represented a financial savings for the school. And the lower division students developed an early loyalty to the Academy, providing a dependable stream of well prepared upper division students. The Kindergarten Department, planned as early as 1882, was not established until the 1890-1891 academic year. Like the Primary Department, the Kindergarten was mainly designed to provide practical teaching experience for normals. Miss Teenie Smoot, assisted by monitors from the Normal Department, was placed in charge of the Primary Department for the first three years. At the commencement of the fourth academic year (1879-1880), Miss Smoot was promoted and replaced by Zina Williams (later Zina Williams Card). After Miss Williams left, Caddie Daniels headed the department during its final year of operation. Shortly after the discontinuance of the Primary Department in 1882, Principal Maeser organized the Preparatory Department, replacing the primary and aiding the Intermediate Department. The Preparatory Department, beginning with fourth graders (or fourth readers), continued from 1884 through the remainder of Principal Maeser's administration. The Intermediate Department usually included students from eight to eleven years of age. It also included some older students just emerging from the Primary Department. By the time youngsters completed the intermediate course (equivalent to the fourth or fifth grade), they had adequately mastered the basic fundamentals of a common English education, and their schooling was sufficient to meet the standards of the day. They could read acceptably, write well enough to express themselves, and solve basic arithmetic problems. Upon completion of the intermediate course, many of them returned home to assist on the farm, fully satisfied with their education. On the other hand, students of advanced academic ability who showed interest in continuing their schooling were encouraged to pursue their course work, and to move from the intermediate into the higher division. Unfortunately, many capable students could not afford to continue. Compared to other local schools, Brigham Young Academy's Intermediate Department allowed students to take classes from a variety of teachers. This allowed students to specialize, which was impossible in district schools. "Although professing to keep within the scope of the higher grade of the District Schools, BYA presents, nevertheless, besides its religious training, features which the common schools do not enjoy, as for instance, the number of teachers, each one making his branch a specialty; the comparatively small classes enabling the teacher to watch much closer the development of the individual pupil; the half-hour changes of recitation preventing a weariness coming over the mind of the scholar, and the companionship of more select associations, all moving under the restraining influence of students of greater moral and intellectual development." -- Utah Enquirer, January 3, 1888. Upon moving to the new BYA Education Building in 1892, Principal Benjamin Cluff, Jr., felt it was necessary to establish a Normal Training School. He argued that, until the supply of qualified teachers could meet the territorial demand, free tuition should be offered to students interested in teaching. With high quality Mormon-trained teachers, there would be no need to hire outsiders in Mormon schools in the territory. With the support of Board President A.O. Smoot, and new Superintendent Karl G. Maeser, and with the new Academy Building to house the Normal Department, Principal Cluff persuaded the General Board to establish the Normal Training School. In November 1891, the General Board authorized a special budget of $5,000 to cover the cost of free tuition for normal students. Student teachers needed a controlled teaching experience, which had been impossible to obtain in the school because of overcrowding. 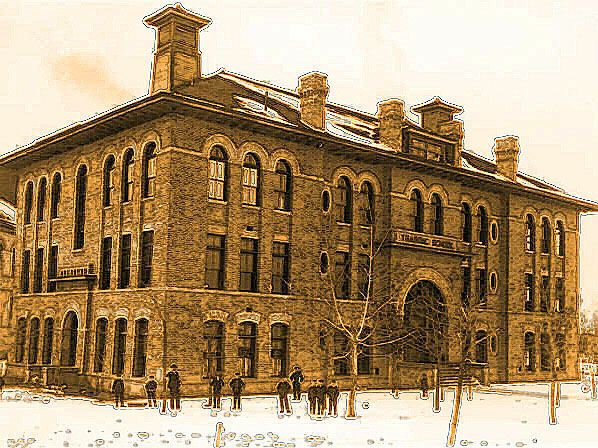 Therefore, in 1896 the primary grades were removed from the crowded Academy Building and housed in the Central Building, located on the southeast corner of First North and Academy Avenue (now University Avenue). In 1902 the Training School Building was completed, facing the northeast corner of what is now Academy Square. The first two floors included elementary school classrooms. The third and top floor was the Men's Gym, essentially a large basketball court with dressing rooms, offices and a large wrestling practice room. Student teachers in the Training School, supervised by professors of the theory of teaching (Pedagogy), assisted as "critic teachers". Second-year normal students were required to organize the schools, conduct the classes and perform all of the duties of actual teachers. Each normal student's day was divided into two and one-half hours of practice teaching, followed by an hour and a half of criticism. The new Normal Training School provided excellent teachers to the region. Able to apply teaching principles as they learned them, Brigham Young Academy normal students entered the teaching profession with a reservoir of practical experience, often at the age of today's high school students. 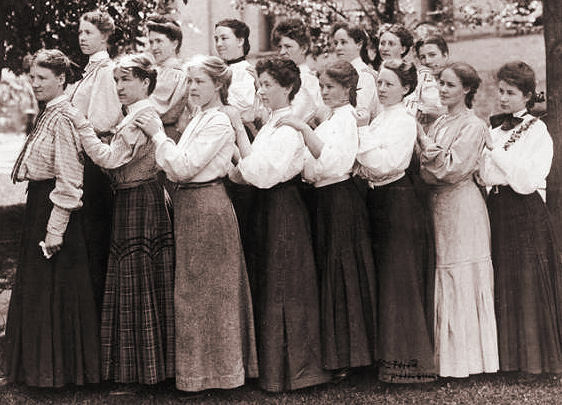 As the reputation of the Training School spread throughout the Intermountain West, enrollment in the Normal Department of Brigham Young Academy gradually increased. Each year a small group of Brigham Young High School students graduated after having attended Kindergarten through 12th grade at the same school. Other graduates first attended in the 1st, 2nd or 3rd grades, etc. Even for latecomers, the Training School held a special place in their hearts, because elementary, junior high and high school programs often intermingled students from kindergarten and all twelve grades. For example, Children's Theatre productions brought students of all ages together. 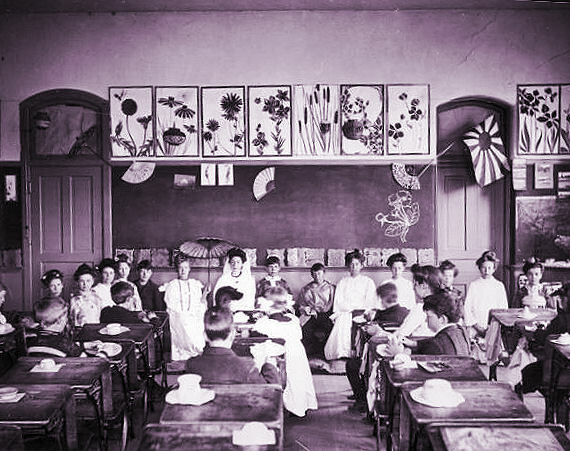 Kindergarten student teachers in 1906. 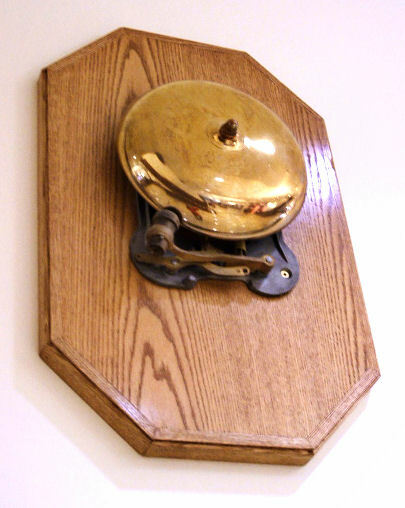 Second Floor Training School bell.